While Omar Khayyam might have preferred “jugs” of wine, if you are one of the over 4,000 people planning to attend the WineFest 2007 Public Tasting and Auction on March 10, you might want to consider something a bit smaller. There will be close to 1,000 wines at the tasting. How those wines get there and what they represent for the Hilton Head Area Hospitality Association, WineFest’s producer, is a much bigger story than the one day event. “The judging and competition have always been viewed as separate from WineFest. I wanted to coin the two together so that people understood that the wines that are represented at the auction, for the most part, are award winners,” said the Association’s new executive director, Ann-Marie Adams. She was referring to the American Institute of Wine and Food (AIWF) sanctioned International Judging and Competition that was held the first weekend in February on Hilton Head Island. Over 70 judges descended upon the Westin Resort to sample over 1,000 entries from over 750 vintners, large and small. “The wines from the competition come from all over. There’s the ‘big three,’ California, Oregon and Washington. But I saw some from New Mexico and Texas, too,” Adams said. The most unusual? “I saw a blueberry from Marathon, New York. I guess it’s unusual because that’s dairy country,” she said. Every judge at the competition is certified. Some work at restaurants as sommeliers; others get certification through a beverage distributor. Still others are simply vinophiles, and their passion is wine. The Association has a database of 200 certified judges. “Some have been coming since the very beginning,” Adams said. WineFest is celebrating its 22nd year. “They’ll arrange their entire work schedule, their family’s schedule, anything to get here,” she said. Tying the competition and the tasting together is one big change for WineFest2007. Four AIFW wine dinners are scheduled on the Thursday and Friday just prior to the tasting and auction on Saturday. “The Association’s main goal is to fulfill our mission to our members, which is to drive overnight accommodations and increase dining out experiences. In order to do that we have created the opportunities so that people coming to WineFest will stay two, three or four nights. We believe our wine dinners will attract people for longer stays,” Adams said. The participating restaurants: Sage Room, Antonio’s, The Barony at the Westin, and Hinoki, will serve fixed price, four- and five-course dinners. A winery will be the host at each restaurant. “Part of our mission is also to show visitors the kind of culinary and wine professionals our membership has. These dinners will showcase their amazing talent,” Adams said. When Saturday rolls around, come rain or shine, WineFest 2007 will kick off at 1 p.m. at Shelter Cove Community Park. The first hour includes a silent auction of some of the award-winning wines. “We’re going to have another first. At 2:15 p.m., we’re going to do a toast to ‘Papy.’ We believe he had the first licensed winery in South Carolina, and we’ll take anyone to task if they argue with us,” Adams said, laughing. The “Papy” to whom Adams refers was the legendary Arthur “Papy” Burn, Jr. who started the Silver Dew Winery on Daufuskie Island in 1953. The winery, which was once an oil shed for the Bloody Point lighthouse, has been restored. If anything, WineFest resembles a big block party. There will be live music, gourmet treats as well as opportunities to talk with the winemakers and just have fun. “WineFest gives everyone the opportunity to participate in a culinary culture, a wine culture. It’s definitely not reserved for the elite. It’s an opportunity for everyone to expand their palate,” Adams said. 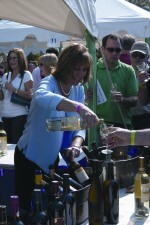 WineFest requires a very dedicated group of volunteers to make the event possible. “From the competition and judging, to the tasting and auction, it all happens because of the volunteers. It just wouldn’t happen without them,” said Adams. At 3 p.m., the live auction begins. By this time the “Best of Show” and other awards have been announced. The live auction benefits the Hospitality Association’s scholarship fund. (Scholarships are awarded to students enrolled in hospitality-related fields.) “We hope people will take advantage of the chance to bid on some exquisite wines they may not have easy access to locally,” Adams said. “Wine is for everybody, WineFest is for everybody,” Adams continued. Papy Burn would most likely agree. Proceeds benefit Hilton Head Area Hospitality Association scholarship fund. Admission is $30 per person 21 and over; 6-20 years; $5 per person; under 6 years; FREE. Includes tasting, gourmet treats, auctions and Stolzle souvenir wine glass (first 3,000 guests).For more information, visit www.hiltonheadhospitalityassociation.com/winefest.